The Hôtel Charost is located at 39 rue du Faubourg. On the ground floor in the Salon Rouge hangs a portrait by Alexis-Simon Belle of King James III and VIII. 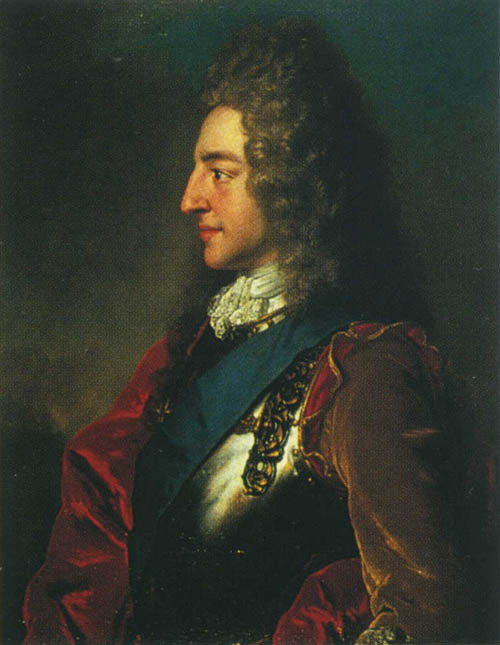 1 James is shown in profile, wearing a cuirass and the sash of the Most Noble Order of the Garter. Today the Hôtel Charost serves at the residence of the Ambassador of the United Kingdom of Great Britain and Ireland to the French Republic. 1 The oil on canvas portrait measures 79 cm high and 61.5 cm wide. Alexis-Simon Belle was born in Paris in 1674, and died in the same city in 1734. In spite of the fact that he won the Prix de Rome, he chose not to train at Rome but rather to remain in France. In 1701 he moved to Saint-Germain-en-Laye where he worked for the English and Scottish court. He painted at least ten portraits of King James III and VIII, as well as others of his parents and his sister Princess Louise-Marie. Other portraits of James by Belle can be seen at the Scots Collegein Paris, at the Oratorio di San Giuseppe in Urbino, at the Palazzo Doria Pamphilj in Rome, and in Pesaro. 2 Mary Beal and John Cornforth, British Embassy, Paris: The House and Its Works of Art (Government Art Collection, 1992), 20. Image 1 (James III and VIII, by Alexis-Simon Belle): Edward Corp, The King over the Water: Portraits of the Stuarts in Exile after 1689 (Edinburgh: Scottish National Portrait Gallery, 2001), 52. This page is maintained by Noel S. McFerran (noel.mcferran@rogers.com) and was last updated April 18, 2008.